We’re a week or so away from unveiling my Introduction to Thai massage workbook. I’ve spent countless hours and energy pouring myself into the sequence, text and design components of the material. The absolute hardest part of teaching or releasing anything definitive in Thai massage is the fact that every session is different. A workbook, text or a book are not improvisational. Thai massage is improvisational by its very nature. No two bodies are the same and even though the dance is similar I’ve never had two of the same sessions. 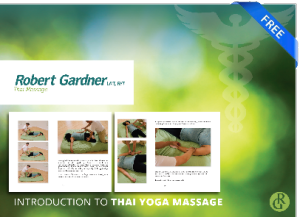 The photos and text are being compiled and I go back and forth with my associates to make sure we release something that’s easy to read, easy to understand and shows the basics of Thai massage in a way that anyone can use. Stay tuned, the workbook will be here soon.